The game is developed by Titutitech and published by Square Enix. 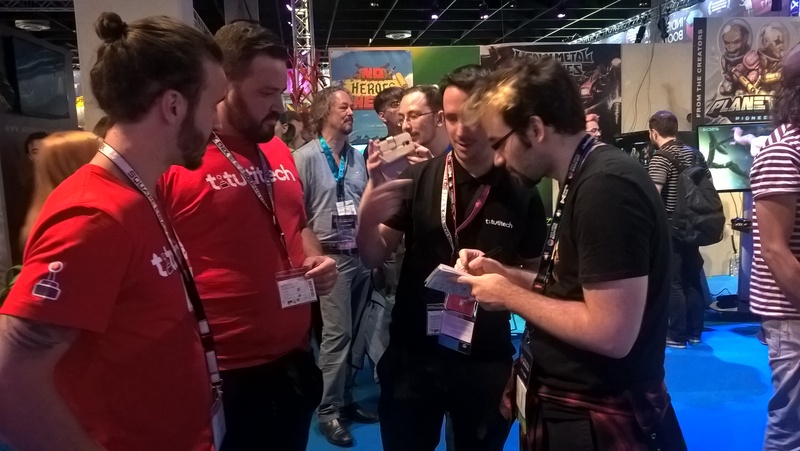 We found the developers of Titutitech at the Indie Arena Booth of Gamescom 2017 and we asked them a few questions about their team and their game, Oh My Godheads after taking a shot at it in a few rounds of triple multiplayer chaos with my colleagues Dimi and Marilena. Federico Sauret, Michael and Sergio were all there to tell us everything we wanted to know about the studio. Started in Barcelona with four people two years ago, Titutitech was basically a studio that worked as an outsource development workforce for games. At some point, they came up the idea of making a local multiplayer game that eventually, after a lot of prototyping and capture the flag testing as Federico noted, led to what the game is all about now. Picking up a huge head and having it deal damage from time to time. The game has been in development for one and a half years already and they also hyped us for an announcement that will be coming out from them soon. It is something confidential but nonetheless we are always looking forward to surprises from indie devs. Apart from that, they also told us that they plan on attending a whole lot more events from here on. For more info on Oh My Godheads, check out the game’s website, Facebook page and Steam page.